For 30 years Garbage Pail Kids have been grossing people out with their scatalogical, deformed, and otherwise grotesque visages. 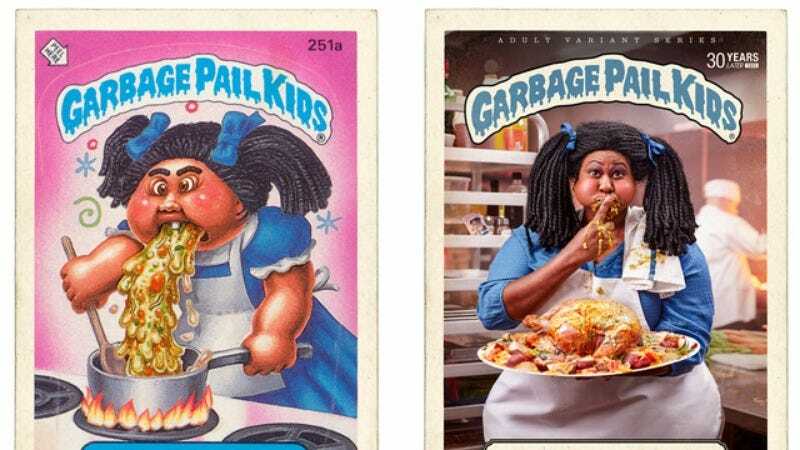 Originally conceived as a freakshow parody of Cabbage Patch Kids dolls, the Garbage Pail Kids cards and stickers led to lots of controversy, a TV series, and an unfortunate film. Two artists, Jake Houvenagle and Brandon Voges, recently collaborated on a project that revisits everyone’s favorite creepy little children 30 years later, reimagining them as adults. Many of the deformed kids have since learned to embrace their freakish nature and seem to be thriving. The comparisons between the two versions can be seen below, but visit the artists’ website for a more detailed look at the adult variants and an in-depth biography of what the former Kids are up to now.